I personally have never been to Calgary, but do know a few people who have and they seem to enjoy it quite a lot. This map and included addresses shows a Calgary in an easy to understand way that makes it all the more interesting. Maps with lots of details offer not only more to look at but make it more fun and give you lots to learn, and are pretty easy to read to most people. Seeing the map and reading the descriptions do inspire me to one day going to visit Calgary. Barry's Response - Well, welcome if you ever do visit, Shelby. Drop us a line. There's room for one more, and thanks for your response here. The photo is very beautiful and very natural.it makes the people to know the places of calgary and make them get interested in visiting that city while seeing this. 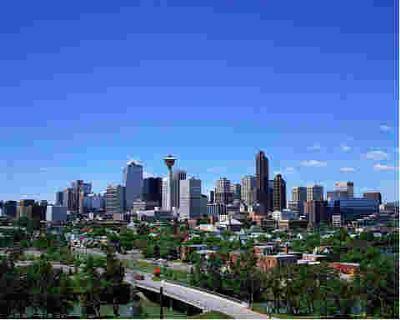 Nestled just east of the Rocky Mountains in the province of Alberta is the city of Calgary. A city with a rich history, Calgary is the third largest city in Canada and was recently voted the world's cleanest city by the Mercer Quality of Life Survey. Calgary was lao the first Canadian city to play host to the Winter Olympic Games in 1998, and many of the facilities constructed for those games have given Calgary a reputation as a fantastic sporting destination. In fact, some of the world's best skiing is located a short drive from Calgary at Banff and Lake Louise. Calgary has come into it's own as one of Canada's premier cities and this reputation is bolstered by a thriving economy, quality homes, and great education. The major base of Calgary's economic picture is dominated by the booming oil industry. In an age where oil is rapidly becoming the world's most precious commodity, Calgary has excelled in carving out a niche for itself based on the enormous oil deposits that lie beneath Alberta. However, the city has remained cognizant of the need to diversity its economy and has developed a dynamic tourism industry that brings over 3 million people to the city annually. One of the more well-known tourist events is the annual Calgary Stampede. the photo is very beautiful.it makes the people to get interest in visiting that city while seeing this. It is very nice one. there are several informations are there.